The value of any $20 brown back is just based on the condition and bank of issue. Some can be worth as little as a few hundred dollars if they are from a common bank and in circulated condition. 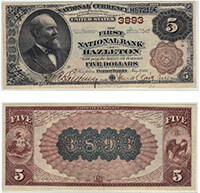 Notes from rare banks that are also high grade could be worth in excess of $2,000 or even more. Please contact us for details. Don't forget to check the serial number. Number 1 notes always sell for nice premiums.